Dad's Railroad - Finished Product! 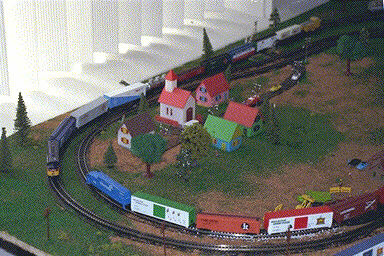 The challenge - build a simple N scale railroad without having the luxury of time to do a picture-perfect job. The goal was to make it sturdy, bright and attractive. I think we did okay, too. 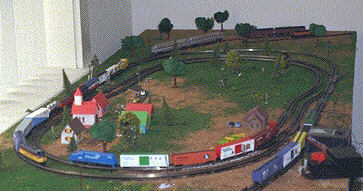 The railroad was finished in a couple of two-hour sessions. The methods we used for scenery are those given in our online scenery manuals. 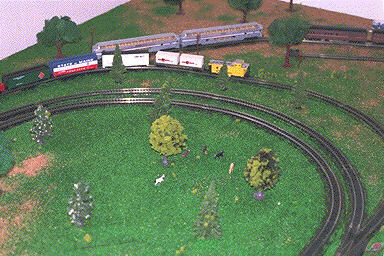 The layout is two loops with a passing siding and freight sidings. The near side passes a small "village". 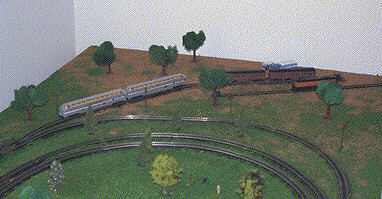 Here you can see the passing siding and the far siding, currently occupied by one pair of Vista Domes and another of PRR Heavyweight passenger cars. 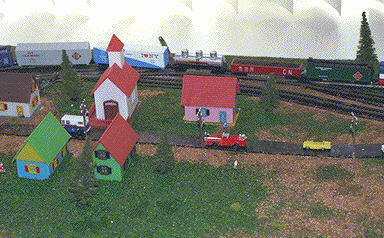 The village is simple" "Village in a Bag" houses and a few people and vehicles by IHC and Model Power. The roadway is "Instant Roadbed" into which we embedded 'coal' to give a blacktop effect. A few horses graze in the field as a small consist of 40 foot boxcars rumbles by.